Already? I hear you cry! Yes, I reply… in what was a fairly dull conversation I’d admit, but it does mean that it’s time for Will Sutton’s brilliant – Day of the Dead event. After the success of the sell out event at The Square Tower last year, there will be another eclectic mix of spoken word and music to celebrate Halloween and all that is dark and gruesome. I will be reading an excerpt from a future novel called THE INFORMATION – a middle grade, fantasy, sci-fi adventure set in a macabre future world. I wrote the draft of this book one morning on a golf course… I got hit a bit, but a few golf ball scars have certainly enhanced my profile. Tales and songs performed by the writers themselves. 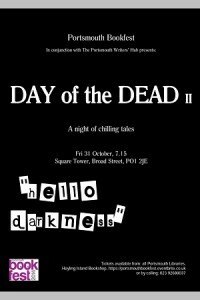 Alongside the talented authors who created last year’s sell-out Day of the Dead event, Portsmouth Writers’ Hub brings you fresh voices to confront the darkness.